One of the newest jewelry trends is setting warm-colored gemstones in silver, rather than gold. Amber can range in color from dark brown to a light, almost clear, lemon yellow. Most amber that has been used in jewelry is from the region of the Baltic Sea or the Dominican Republic. Amber is one of the few substances considered a gem that is not of mineral origin (diamond, jet, pearl, and ivory being the others). Beautiful Honey, Green, and Yellow Amber set in Sterling Silver, features 9 pieces of polished amber. Pin measures approximately 2.25" long by 1.25" wide. Amber from the Baltic is older and more valuable but amber from the Dominican Republic is more likely to have insect inclusions, which are prized by collectors. The largest mine in the Baltic region is in Russia, west of Kaliningrad. Baltic amber is found in Lithuania, Latvia, Estonia, Poland, Russia, and occasionally washed up on the shores of the Baltic Sea as far away as Denmark, Norway, and England. Honey, Yellow, and Green Amber set in .925 silver. Features carved multicolor polished amber stones set in a beautiful Silver Butterfly pin. Pin. Measures approximately 1.5" long by 2" wide. All Amber began as a sticky resin that oozed from ancient pine trees. Small insects, plant material, feathers, and other small objects in the path of the flow became entrapped. Over time, through a process of heat and pressure, the resin was encased in dirt and debris, and fossilized to become amber. Pendant set in .925 silver features 3 polished amber pieces set in a spiral sterling silver setting. Pendant measures approximately 1.5" long by .75" wide. Amber is very soft and can be scratched easily. Bracelets and rings with amber cabochons should be worn with care to prevent marring the stone. Much of the amber used in commercial jewelry is actually reconstituted – made by fusing small chips, powder, and ground-up stones with a plastic resin – which makes it harder and less prone to scratching. Reconstituted amber usually doesn't have natural inclusions. Amber stirs the soul, delights the eye, and warms the heart: it's the living stone. It radiates sun and solar energy, transmutes negative into positive energy, and promotes positive thinking. A good luck charm for travelers, Amber revitalizes mind, body, and soul and helps to relieve depression. It gives pain relief for teething children, and aids in healing wounds. Amber was made popular by the film Jurassic Park, when dinosaur DNA was pulled from a mosquito embedded in amber. Most amber around the world was formed in the Tertiary period, Eocene to Miocene (30-40 million years), although some amber has been found as old as 60-80 million years. Amber is probably the first gemstone to be worn as jewelry – it was used in adornment making as far ago as Neolithic epoch of the Bronze and the Iron Ages. Especially wide application in producing jewelry and artistic items from amber is found in 17th and 18th centuries. Not only used for jewelry, Amber was applied as a decorative stone for trim in the interior of unique buildings, such as the Amber Room in the Palace of Ekaterina the Great. 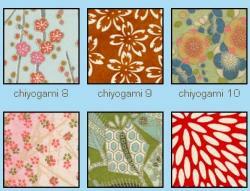 My most recent body of work is inspired by wonderfully decorative chiyogami papers. These hand silk screened papers, which often display organic or geometric elements, can be incredibly ornate. Based on bright kimono textiles, these designs were developed in the Edo period as woodlbock prints and used to enliven farmhouse interiors. I extract small scenes from these papers, set them in sterling silver, and then protect them under a thin waterproof layer of resin. Have fun browsing the collection of necklaces, earrings, bracelets, and rings. All styles are available in any of the thirty-six papers shown. Choose a style, choose a paper, and we'll make it. So, cool. 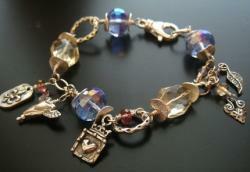 Customer can either select from her ready made jewelry or design their own. She's got a whole page full of paper samples to choose from, sort of the whole design your own jewelry trend again. The chains on her necklaces are pretty cool, but she makes all kinds of jewelry for this paper collection including earrings, rings, and bracelets. 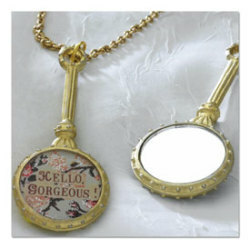 Signals is one of my favorite web sites and catalog companies to shop for unusual jewelry as well as other gift items. I confess the "gift" is too often for myself, but I find some great holiday presents here as well. There jewelry if very often hand-crafted and so today I was caught up with looking at their mixed media pendants. For example, the one pictured left is called "Hello Gorgeous!" and it is says that on one side of the pendant in a tiny collage. The other side has a small mirror. The pendant is accented with crystals and the bezel is 14kt gold plated over pewter. Here's another pendant called "Patron Saint of Eternal Optimism." 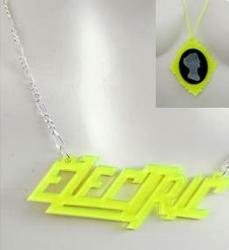 It comes with a silver plated chain and the pendant is made using techniques similar those of stained glass, only the solder is lead free so it's safe to wear. Finally, this sterling silver heart pendant with purple colored Freshwater pearl hangs from suede cord. I'm still enjoying the mixed media wave. Yes, sometimes I think people get a little carried away with mixing up materials that don't always make for a fashionable and functional piece of jewelry, but there are designers out there that seem to be able to handle the mixed media trend. Take, for example, the Vitra collection from Sepia, which includes a mixture of glass, metal, and even suede. Way cool, and these are pieces you can imagine actually wear comfortably. 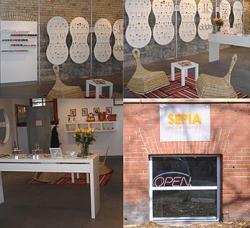 Sepia is a fashion company. Our mission is to bring the latest fashion trends from Latin America supporting emerging artists. We want to offer the best and latest Latin American designers' styles in a wide range of price points and make them accessible to the women of America . Specifically, we support those young artists that prefer to incorporate alternative materials and colors in their pieces, reflecting the latest fashion tendencies. 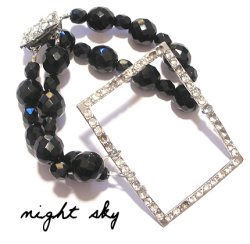 This bracelet has a glass cab in the middle with a suede strap. Then there are lots of fused glass earrings to pick from too, as well as rings. I found this while cruising through the Cool Hunter web site because I was in the mood for something sort of "out there," and where else are going to find cool stuff? Okay, yes, there are other cool sites, but I know I can always find something really different there, jewelry or otherwise, such as these pins or buttons or button pins from Prickie.com. Prickie is a unique button badge design company that is bringing the age old button pin badge back into fashion. More than just an online store, Prickie serves as an online gallery which promotes artists designs on their unique badges. With online opportunities for artists to share their work becoming increasingly popular, Prickie is perfect for both novice or established designers to share, promote and distribute their work through a simple and appealing product. This is a great idea! It sort of the I'll scratch your back and you scratch mine philosophy. Hey, who cool is this? I also am one of three sisters. Wouldn't it be cool to create and sell your own hand-crafted jewelry together as a family? Tough, but cool just the same. It started with dominoes, the backs of which are bare. Schewe comes from an artsy family of fierce domino players, and during one game Schewe's sister looked at the domino backs facing her and said, "They're boring. They need advertising or something." Nothing would've come of her comment, but she went on about the naked dominoes for 45 minutes, helped by the fact that she – and all of the domino players – had drunk a few margaritas. Schewe was thinking about that day as she cleaned up after her kids a few months later. She came across some dominoes, drew on the back of one and sent it to her sister, who drew on another domino and sent that one to Schewe. That went on for a while, and Schewe eventually made a necklace out of one of her sister's creations. 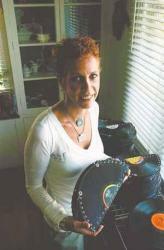 She then started making domino bracelets and selling them off her wrist in the grocery store (shoppers would ask her how they could get one), and after much pushing and prodding from her family, Schewe entered her first art show. The whole mythical slash fantasy slash nature trend is hot this season and the next, so expect to see lots of unusual mixes of materials (yes good ol' mixed media) and suggestions of fairies, nymphs, and the like. The Orion's Lover Collection uses fabulous vintage belt buckles and pairs them with natural gemstones such as Peruvian Opals as well as freshwater pearls. Each piece in the collection is one-of-a-kind. "I love creating one-of-a-kind pieces," said Juniper designer Jenifer Altman, "My customers love the fact that no one else will be wearing what they are – they are very discriminating." Each piece in the collection is named for a place, event or character in the tale of Orion and how he was destined to forever appear in the heavens. The Calliope Collection, named for the Greek muse of epic poetry, is handcrafted of vintage pen and calligrapher pens. "I have always been such an avid reader and I love to write – this seemed like such a natural collection to create," Jenifer said. Each piece in the collection is named for the designer's favorite authors. The collection is particularly appealing to boutiques and retailers because though each piece is one-of-a-kind due to the nib itself, it can be reproduced in great numbers. "I really dedicated this collection to not only my favorite writers, but also all of the women who dare put pen to paper."